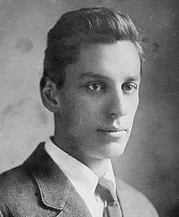 Max Eastman was an American poet, philosopher and, in his younger days, a keen exponent of radical politics as practiced amongst people of a similar outlook in areas of New York City such as Greenwich Village. He was a patron of the “Harlem Renaissance” which promoted African-American culture and literature and he developed a strong affiliation with communist and socialist movements. However, following a visit to the Soviet Union in the early 1920s, he became disenchanted with the communist ideal, especially after the assassination of Leon Trotsky and Joseph Lenin’s purges on the Soviet people. He was born Max Forrester Eastman on the 4th January 1883 in the Ontario County town of Canandaigua which is part of New York State. He was the son of a minister of the Congregational Church and both of his parents had an interest in social issues such as the “Underground Railroad” route set up to aid the progress of escaping slaves. During his youth he met Mark Twain who was a friend of the family. He was well educated and in 1905 he gained a bachelor’s degree at Williams College, Massachusetts. Eastman was keen to gain a doctorate in philosophy and, to this end, he studied at Columbia University under a famous tutor named John Dewey. Having gained his PhD he settled in Greenwich Village, seeking out the company of people of similar views as himself and his early political activities included the setting up, in 1910, of the Men’s League for Women’s Suffrage. He had a short-lived marriage to the radical activist Ida Rauh which ended in 1922 and he then remarried, this time to a Russian artist called Elena Krylenko. This would end on her death in 1956 and he then married for a third time. In addition it is believed that he had many affairs during his lifetime. His literary life began with the editorship of, and contributions to, a socialist magazine called The Masses and Eastman was one of many poets who became involved, including Amy Lowell and Carl Sandburg. He took a controversial stance against America’s involvement in the First World War and generated the attention of the authorities on many occasions. Eastman stood trial for sedition twice but was acquitted both times. In 1919, in collaboration with his sister Crystal, he set up a similar magazine called The Liberator. His trip to the Soviet Union in 1922 resulted in a change in his political views. He soon became disenchanted with what he could now see at first hand and, within two years, he had left the country, following this with a three-year stay in Europe. He was very active as a writer of articles and poetry and, in all, he published at least twenty books on diverse subjects including the soviet culture and philosophy. He produced five collections of poetry and also one novel. For the rest of his life he stayed politically active, often writing in starkly critical terms on the subject of communism and also America’s involvement in conflicts such as Korea and Vietnam. Max Eastman died at his summer home in Bridgetown, Barbados on the 25th March 1969, at the age of 86.